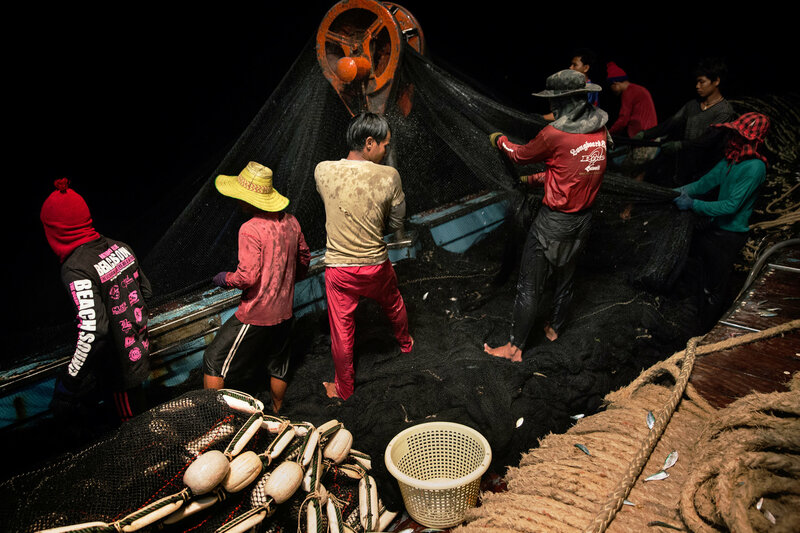 While forced labor exists throughout the world, nowhere is the problem more pronounced than here in the South China Sea, especially in the Thai fishing fleet, which faces an annual shortage of about 50,000 mariners, based on United Nations estimates. The shortfall is primarily filled by using migrants, mostly from Cambodia and Myanmar. 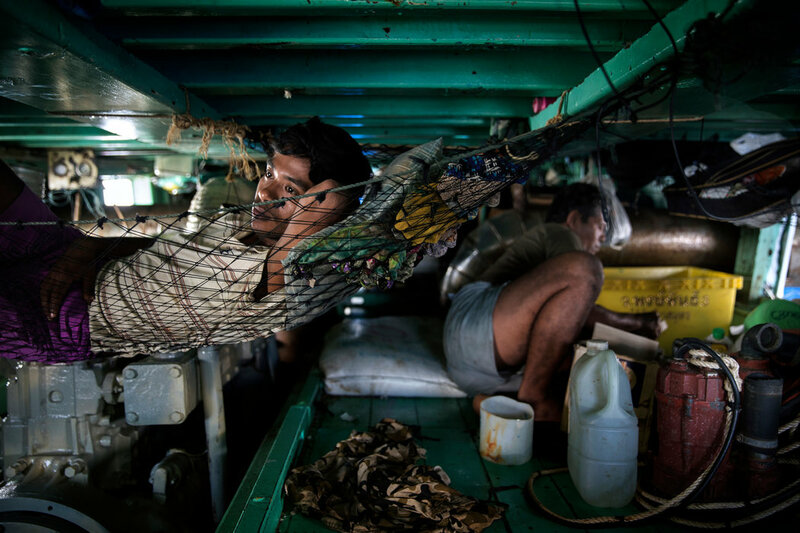 Many of them are lured across the border by traffickers only to become so-called sea slaves in floating labor camps. Often they are beaten for the smallest transgressions, like stitching a torn net too slowly or mistakenly placing a mackerel into a bucket for herring, according to a United Nations survey of about 50 Cambodian men and boys sold to Thai fishing boats. Of those interviewed in the 2009 survey, 29 said they had witnessed their captain or other officers kill a worker. The migrants, who are relatively invisible because most are undocumented, disappear beyond the horizon on “ghost ships” — unregistered vessels that the Thai government does not know exist.They usually do not speak the language of their Thai captains, do not know how to swim, and have never seen the sea before being whisked from shore, according to interviews in Malaysia, Thailand and Indonesia. These interviews, in port or on fishing boats at sea, were conducted with more than three dozen current deckhands or former crew members. Government intervention is rare. 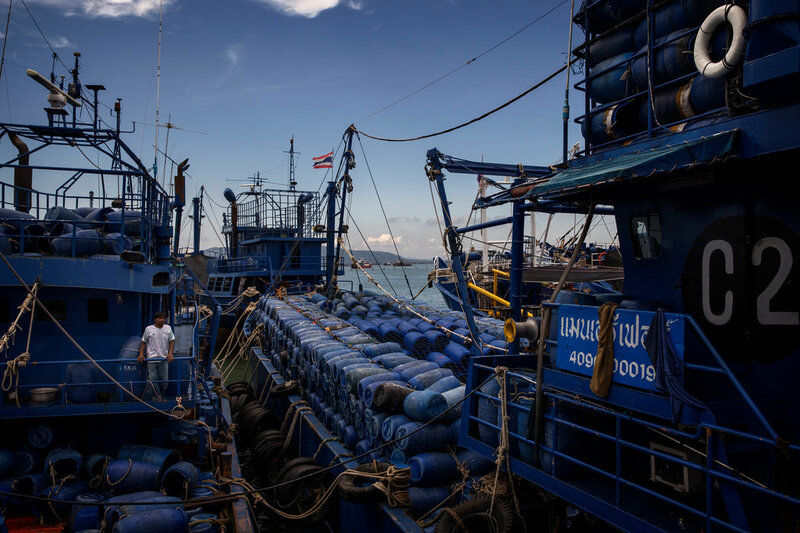 While United Nations pacts and various human rights protections prohibit forced labor, the Thai military and law enforcement authorities do little to counter misconduct on the high seas. United Nations officials and rights organizations accuse some of them of taking bribes from traffickers to allow safe passage across the border. Migrants often report being rescued by police officers from one smuggler only to be resold to another. The United States is the biggest customer of Thai fish, and pet food is among the fastest growing exports from Thailand, more than doubling since 2009 and last year totaling more than $190 million. The average pet cat in the United States eats 30 pounds of fish per year, about double that of a typical American. Though there is growing pressure from Americans and other Western consumers for more accountability in seafood companies’ supply chains to ensure against illegal fishing and contaminated or counterfeit fish, virtually no attention has focused on the labor that supplies the seafood that people eat, much less the fish that is fed to animals. Traveling the coast of the South China Sea, it can seem that every migrant has his own story of abuse. Skippers never lacked for amphetamines so laborers could work longer, but rarely stocked antibiotics for infected wounds. Former deckhands described “prison islands” — most often uninhabited atolls, of which there are hundreds in the South China Sea. Fishing captains sometimes maroon their captive crews on those islands, sometimes for weeks, while their vessels are taken to port for dry docking and repair. Other islands, inhabited but desolate, are also used to hold crew members. Fishing boat workers on an Indonesian island called Benjina were kept in cages to prevent them from fleeing, The Associated Press reported earlier this year. Inaccessible by boat several months a year because of monsoons, Benjina had an airstrip that was rarely used and no phone or Internet service. Thai government officials said they have stepped up the number of investigations and prosecutions and plan to continue doing so. A registration drive is underway to count undocumented workers and provide them with identity cards, added Vijavat Isarabhakdi, Thailand’s ambassador to the United States until this year. The government has also established several centers around the country for trafficking victims. Critics have faulted Thailand for what they say is a deliberate failure to confront the larger causes of abuse in fishing. Compared to its neighbors, Thailand has less stringent rules on how long boats can remain at sea. Last year, it was the only country to vote against a United Nations treaty on forced labor requiring governments to punish traffickers, before reversing its stance in the face of international pressure. Thai officials also proposed using prison labor on fishing boats as a way to shift away from migrant workers, a plan dropped after an outcry from human rights groups. In 2011, Asorasak Thamma was kidnapped in Thailand and enslaved on a fishing boat. Interviewed last year, he had not been home since. A mothership in Songkhla. These large vessels carry barrels of ice and other supplies to fishing boats in international waters.